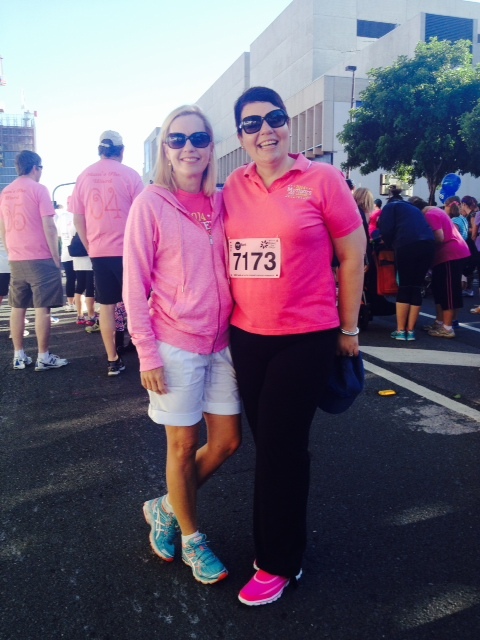 Yesterday, I did the Mother’s Day Classic Walk/Run in Brisbane. The event is held across Australia on Mother’s Day to raise money for breast cancer research. I am unfit and inherently lazy (gee, I wonder if those two things are linked?) but I was intent on doing my part to raise money for research, and also to prove to myself that one year on from treatment, I could do it. Raising money for cancer research and support is something I committed myself to during my treatment. Every day that I sat having a combination of docetaxel, doxorubicin and cyclophosphamide infused into my body, I thought a lot about the science behind the cytotoxic cocktail that was hopefully going to save my life. The regime of chemo I had – called dose dense because it is infused every two weeks instead of the usual three – is used for patients whose tumour is large and has spread into the lymph nodes. Dose dense has been proven to significantly increase the chances of survival in people like me. The dose dense regime requires the use of an additional drug called pegfilgrastim to help boost the white blood cell count so that the chemo drugs can be given more frequently. Basically, without pegfilgrastim dose dense chemo would not be able to be used as a treatment because the patient would be at risk of serious or fatal infection. Pegfilgrastim was approved for use in 2002, ten years before my diagnosis. So, if I had been diagnosed 11 years earlier than I was, I would not have been able to have the treatment I did, and my chances of survival would have been greatly reduced. I read an article the other day which said it takes an average of 17 years for evidence-based research findings to be put into clinical practice. So perhaps in 1985 or 1986, when I was watching Live Aid whilst admiring my new Swatch watch, or seeing Ferris Bueller’s Day off whilst sporting my asymmetrical ‘Flock of Seagulls’ haircut, researchers in the US started looking for solutions to the problem of chemotherapy causing the white blood cell count to drop to dangerous levels. In 2002, when I was single and carefree, spending my weekends drinking too many canned vodka premixes and watching Footballers Wives, the government gave the green light for pegfilgrastim to be used on patients undergoing dose dense chemo. Which meant that in 2012, when I was the married mother of a four-year old facing an earth-shattering diagnosis, I could have the treatment I needed. My efforts in raising or donating money for breast cancer research today is not likely to be of any personal benefit to me, but that is entirely the reason I do it. Those who raised funds in the 1980s didn’t see the benefit of their efforts, I did. And so it must go on. Yesterday was a long way from the 1980s, and yet walking alongside me was someone I met in 1982. Clearly depressed by the brown-ness of lounge suite and wallpaper situation, circa 1982. 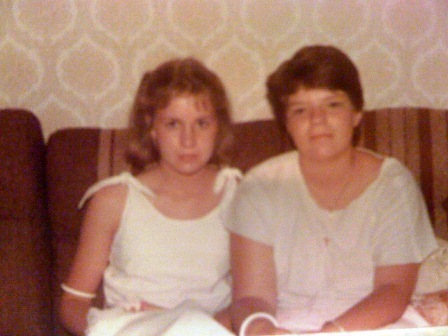 Karin and I have been best friends since the first week of high school, and when I was watching Live Aid, she was there wearing her black Swatch watch (mine was white), and we saw Ferris Bueller at the cinema together (her spiral perm a lovely counterpoint to my own fabulous do). We have seen each other through boyfriends, weddings, births, miscarriages, divorces and all the rest of life’s dramas, a constant source of support, honesty, love and reality for each other for more than 32 years. The morning I received the phone call to tell me I had breast cancer (a call which was not meant to come through until late that afternoon), literally 30 seconds after I hung up the phone an SMS came through from Karin, which said ‘Have you heard anything yet?’. Early on in my diagnosis, Karin told me baldly that it was simply not possible that I would die, because I was the keeper of our memories. She has a shocking memory for faces and names (and places and dates), and so has always relied on me to fill in the blanks. If I died, who would remind her about the time she got sent to the principal’s office for wearing orange juice bottle lids as goggles in art class? Or about our French teacher whose favoured winter ensemble was a natty turtle-neck jumper and neck-tie combination? Or just how amazing she is, as a friend, mother, partner, daughter and teacher? These days, one of us still has amazing legs, and one of us is wearing tracksuit pants.